You may have seen my previous post on this matter, but I am excited to share that my pet project of making my own version of the Redwall Tapestry is completed, and I would like to share it with you! The image I previously posted has now been made into a beautifully woven blanket, which has given it that more tactile feel as compared to a printed image. I didn't imagine it would turn out this well. I absolutely love how it turned out! The blanket, which can double as a wallhanging piece of decor, is 60 in x 80 in. I would love to make more blanket/tapestry styled works. I was so giddy when this arrived. Feel free to browse this gallery for more detail shots of the piece! I would like to see about selling these, though I have some things I would need to settle to ensure I wouldn't be encroaching on any rights, and that sort of legal stuff. Plus, I don't know how much anyone else would be into the idea, mainly because they are quite pricey to produce at the quality level I find acceptable. 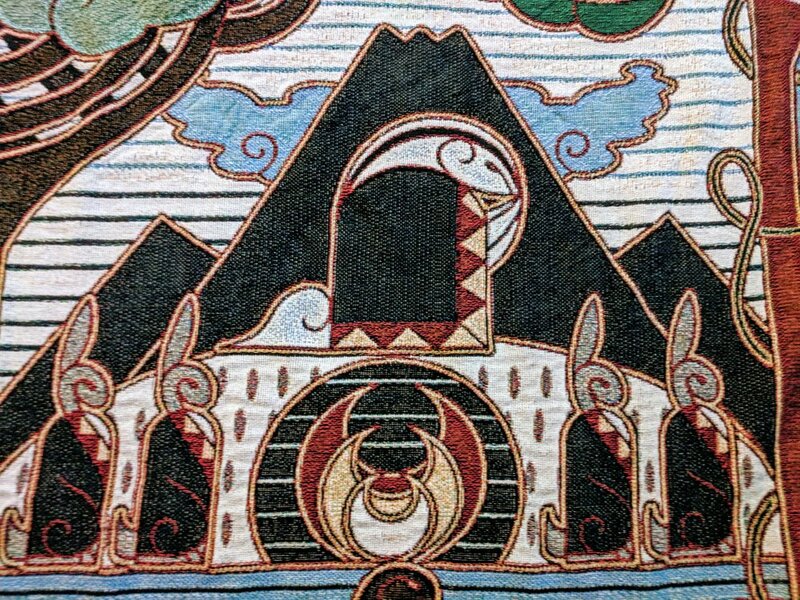 If I were to sell copies of this tapestry, would you care to buy it? Please be aware this isn't for sure a possibility, but if you are interested, the more feedback I get, the more effort I can put into making it a reality (I hope). It’s pretty well known that I am a huge Redwall fan. The books, show, lore and characters were a crucial part of my childhood development. In recent years, I’ve had that passion return more than ever before. And I feel I can more adequately express this now through my skill in art. 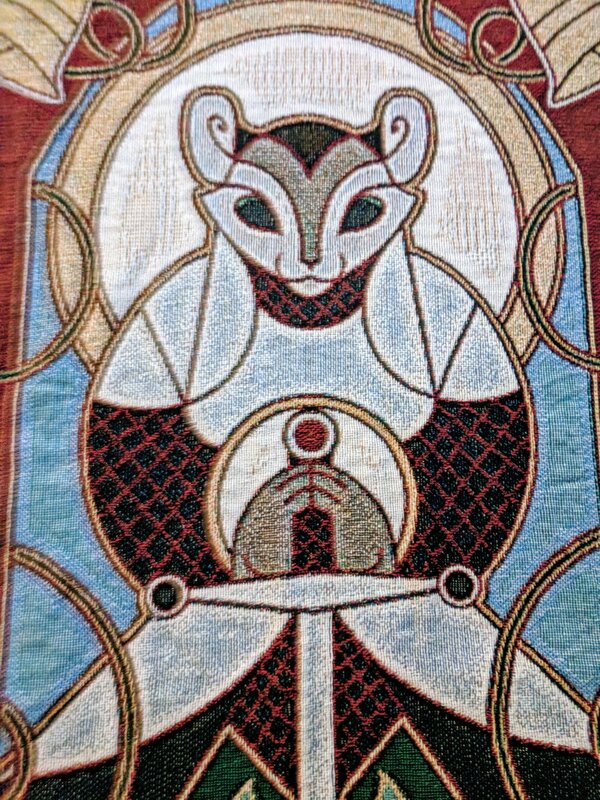 One fascinating part of the stories in the Redwall universe, that I always loved the idea of, was the Redwall Tapestry. And now, I have taken the time to draw up my own interpretation it! My decisions in this design highly reflect historical styles such as Insular art, also known as Hiberno-Saxon art. I wanted my piece to feel like something that would be a proper design for the time period in which Redwall takes place. 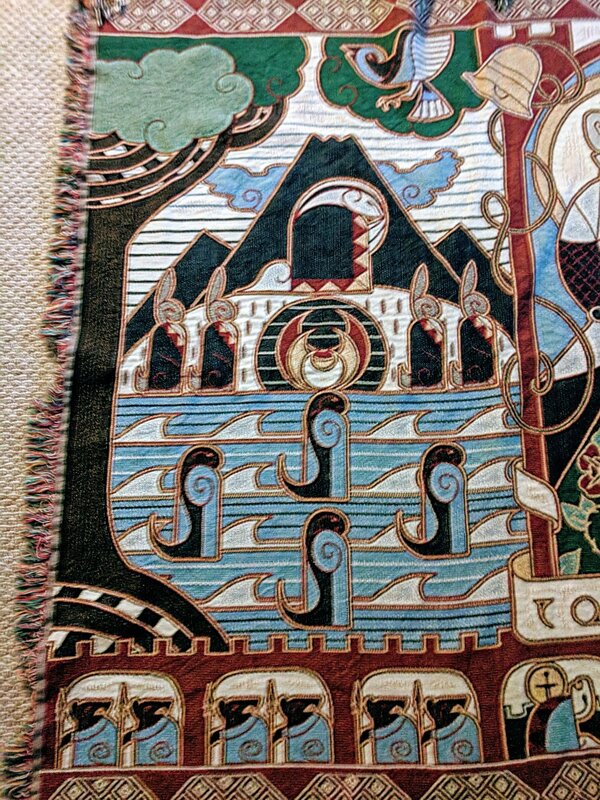 The illuminated scripts of the Book of Kells was a large inspiration. The designs of such historic art reflect a gorgeous complex simplicity, that is so difficult to emulate. Somehow, they feel flat, but extra dimensional at the same time. I wanted to capture the awe and reverence that you might feel while looking at the art from the time period. I also knew that color palettes were limited in that day and age, so I wanted a challenge to ensure I kept it simple, and that I avoided rich royal colors; such as deep blue and purple. Instead I opted for grays instead of blues, which would look like they were a cooler tone while next to the warmth of the rest of the image. 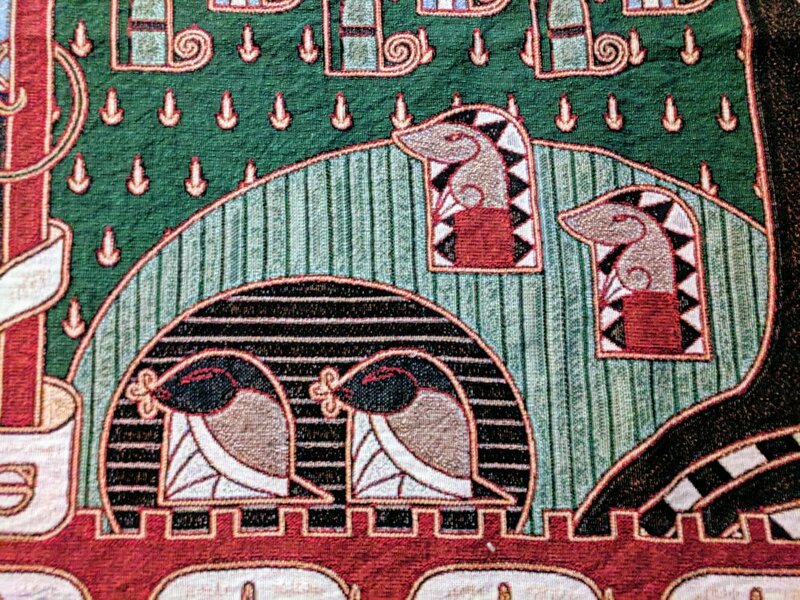 In addition to that, I have also found a way to bring it into the physical world in the form of a huge woven blanket, which I can absolutely see myself hanging up on the wall. The idea of making something like this was absolutely thrilling! But it meant that I would have to deal with another limitation. Making it into a woven piece, I couldn’t do a lot of detail. That was alright, as it was fitting of the insular/hiberno-saxon style to be more simple, with little-to-no shading. I had to ensure the lines I made were bold enough to be captured in the weave. I’m on the next step of ordering the piece, and depending on things from there, I may try to take the time to embroider gold thread onto the physical version. I’ve never embroidered before, but I figure it could be a good time to try! Would you care to see the finished tapestry? Let me know!Are any of you Redwall fans? What’s your favorite Redwall Book and why? I’d love to hear from you!